Dear lovely readers, we have a little bit of homework for you to ponder and think about over the weekend! 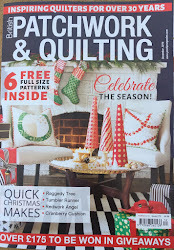 You may or may not be aware but our November 2014 issue is our 250th issue! Can you believe it?! And we want our readers to be involved in celebrating this milestone in as many ways as possible. We will be introducing an exciting Make It Competition in the March issue which will be out in a few weeks and we'll post more details about this shortly. But this weekend, we want you have a think and a thumb through your old issues of P&Q (because we know you all keep them!) and let us know what have been your favourite projects over the years; whether it's one you have enjoyed making or one that really caught your eye and meant to make but have never got round to it! Big or small, quilt or cushion, we want to know about it. You can either comment on this post, tell us on our Facebook page or on Twitter, email us or write to us. We've already made a list of the ones we think have been popular but the magazine is for you, our readers, so it's up to you to tell us what projects have been your favourites.